With 85 minutes played in the latest clash between No. 9 Notre Dame and No. 17 Virginia, the Irish appeared to have no way past Cavaliers sophomore goalkeeper Jeff Caldwell in an ACC quarterfinal that seemed destined for overtime. But as senior midfielder Patrick Hodan whipped in a late corner kick, junior defender Brandon Aubrey rose above all others and forced Caldwell to pick the ball out of his net, as he scored the game’s only goal and sent Notre Dame (10-3-5, 4-2-2 ACC) past the Cavaliers (9-4-3, 4-2-2) and into the next round. 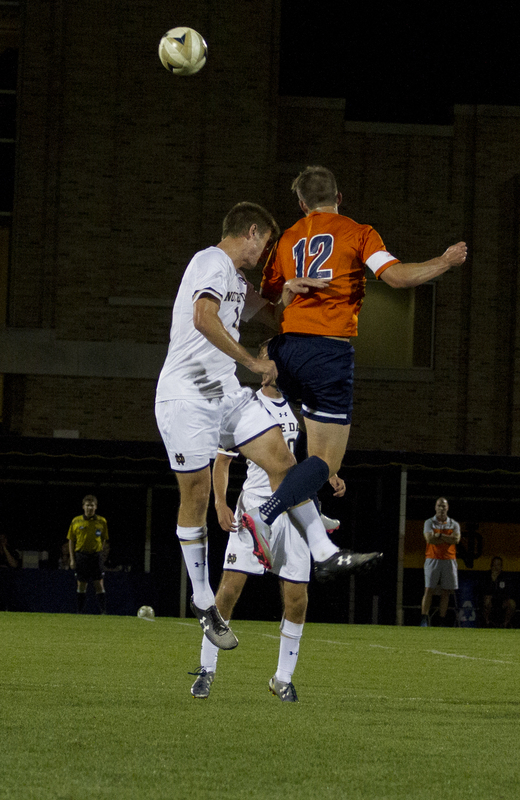 Junior defender Brandon Aubrey goes up for a header during Notre Dame’s 3-1 victory over Virginia on Sept. 25 at Alumni Stadium. The Irish came out slowly, struggling to keep the ball and having difficulty containing Cavaliers freshmen Derrick Etienne and Edward Opoku. Despite an early opportunity with a Hodan free kick that curled wide to the right, Notre Dame struggled to truly get going until Irish head coach Bobby Clark made his usual first-half substitution, bringing freshman forward Thomas Ueland and junior forward Mark Gormley on for sophomore forwards Jon Gallagher and Jeffrey Farina. Clark said the change allowed his team to begin to take control of the game. The 32nd-minute substitutions had an impact almost immediately, as a well-executed free kick maneuver allowed Hodan to find senior midfielder Connor Klekota, who flicked the ball to Gormley, but the forward’s header was blocked and cleared. The Irish came close several more times, as a shot from senior midfielder Evan Panken and a Hodan free kick both went wide before a wild scramble in the Virginia six-yard box saw Ueland beat Caldwell, but not the Virginia defender who waited on the line. Notre Dame continued to have most of the ball in opposing territory in the second half, but it was the Cavaliers who had the first serious chance after the break. Opoku broke free of the Irish defense and hit a shot that had Hubbard beaten to his near side, but it bounced off the post and out of play. When Gallagher and Farina returned to the game in the 59th minute, the Irish put the pressure back on the Cavalier defense. Farina flicked a pass into Gallagher’s path, but Caldwell got just enough of the forward’s shot to see it wide. Minutes later, the ball fell to Farina inside the box, but his powerful shot was tipped over. Gallagher had another chance as the ball dropped to him at the penalty spot, but he couldn’t make clear contact, and the onrushing Caldwell got his hand to the shot. Klekota was the next Irish player with a chance to beat the Cavaliers goalkeeper, after a skillful touch to take the ball down and beat his marker, but Caldwell took the ball from his feet. Hodan had a look at the goal from the corner of the box, but despite an impressive shot, Caldwell got one hand on the ball and pushed it wide. With just over seven minutes left, the Irish could have been forgiven for thinking they would never beat Caldwell. Aubrey unleashed a powerful curling free kick placed perfectly into the top right-hand corner of the goal, but Virginia’s goalkeeper dived the length of the goal to tip it over the bar. From the resulting corner, Klekota had a chance from point-blank range, but again Caldwell answered. Clark credited Caldwell for keeping the game level, but also his defenders for preventing any attacks at the other end. “It was always in doubt,” Clark said. “When it’s 0-0, and they’ve got so many talented players, the game is always going to be in doubt until the goal went in. I would have liked to have seen more goals, but you’ve got to give plaudits to their goalkeeper. Their goalkeeper had some fantastic saves. He had seven saves and some of them were really top-drawer saves, so great job from their goalie. With just three minutes left, Hodan’s corner was met by the high-rising Aubrey, who headed the ball low where neither Caldwell nor the Cavaliers defenders could reach it. The goal proved to be the winner, but Clark said he knew his team needed to stay focused. “I just immediately thought about getting back,” Clark said. “There were three minutes left, so I just thought about getting organized for those three minutes, that’s me. I don’t get over-excited until the final whistle. Once the final whistle goes and you’ve won the match, you can relax, but up until then, you’re always working. It’s always a difficult time. The minute or two after you score a goal, you’ve got to really keep your focus because that’s a time — if you look at statistics — that teams often lose a goal. They score a goal, and then they’ll be so excited that suddenly they’ll lose a goal. So you’ve got to be very careful that that doesn’t happen.